Paragon Hotels Corporation is serving the nation for over 40 years and is one of the independent leading hotel management companies dealing in property development and hospitality management. They have even managed to acquire ownership interest in over 10,000 rooms and 80 hotels across 23 states. They have even focused on generating revenue and even managing various products with the help of innumerable resorts and hotels under the chain. Hospitality management under the banner has acquired a reputable track record over a considerable time frame. The company even offers result oriented directives for innumerable owners of real estate business, non-institutional ownership groups, investors worth high net, private companies and even private equity funds. 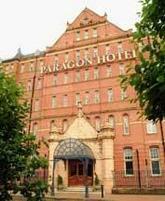 There are currently 0 consumer reviews about Paragon Hotels available. Share your review. Please take a note that you are about to post a public review about Paragon Hotels corporate office on CorporateOffice.com. This review will be public, so please do not post any of your personal information on this website. If you would like to contact the corporate offices of Paragon Hotels, please use their contact information such as their phone number, website, and address listed above to contact them. However, sometimes staff from Paragon Hotels headquarters do read the reviews on this website.